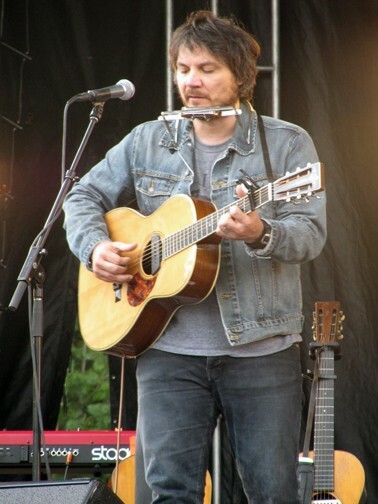 Joe’s Field was packed for the Sunday afternoon acoustic concert by Jeff Tweedy. Giuliano photos. Joe Thompson hanging out on Joe’s Field. The audience whistled along with Jeff. The acoustic set was masterful. 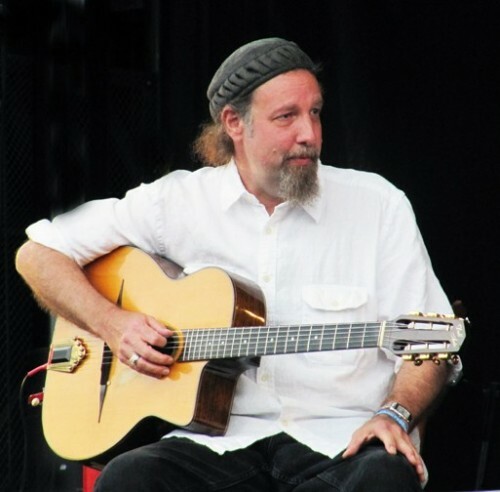 Sir Richard Bishop was the first guest artist. Next up with Nick Zammuto of The Books. 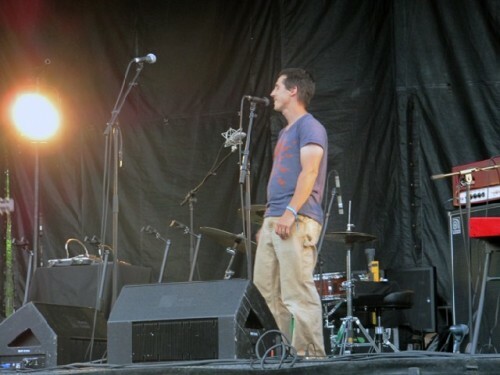 Avi Buffalo performed a number with Jeff. 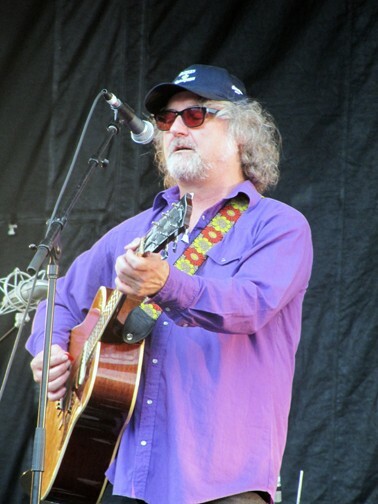 Scott McCaughey of Baseball Project. 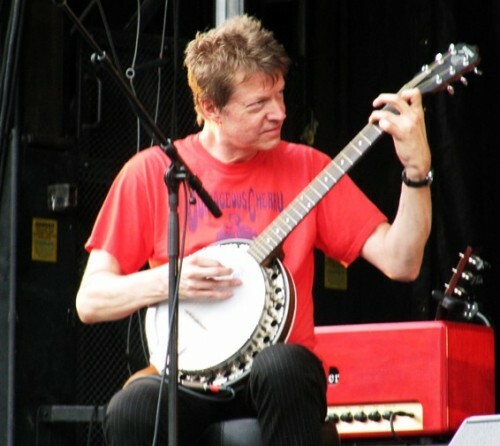 Nels Cline playing slide guitar. 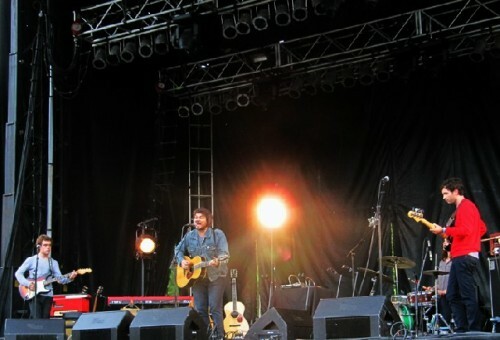 Wilco joined Tweedy for the finale. 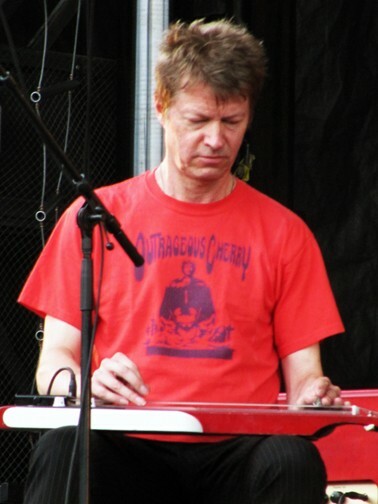 John Stirratt with eyes shut. Avi Buffalo performed earlier in the day in the Hunter Center. The Hudson’s antiques store was busy over the weekend. Last stop before heading home. Well, yes and no. Bottom line you need the numbers to pay for another version of the weekend long Solid Sound Festival. As of Sunday night it was estimated that there were just over 5,000 on Saturday and another 3,500 on Sunday. 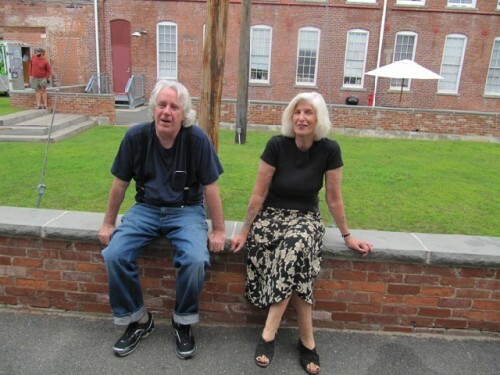 On Friday night Joe Thompson, Mass MoCA's director, told me that as of 9 PM the head count was 1,600. So give or take the festival drew 10,000 for the weekend. Tickets were sold as three day passes swapped for wrist bands. The Transcript reported 6,000 people for the weekend. I suggest 10,000 admissions over three days. Perhaps folks arrived late and missed Friday or left early on Sunday. So the 5,000 for saturday reflects the plus minor factors that equate to 6,000. It is difficult to estimate how many were comped as media, performers, their roadies, and guests. At $95 per pass that means about $600,000 at the gate. Plus concessions. So far Mass MoCA has not posted hard numbers for costs and revenue. On Friday when I asked Tweedy and Thompson if there would be a festival next year their answers were both let’s wait and see. 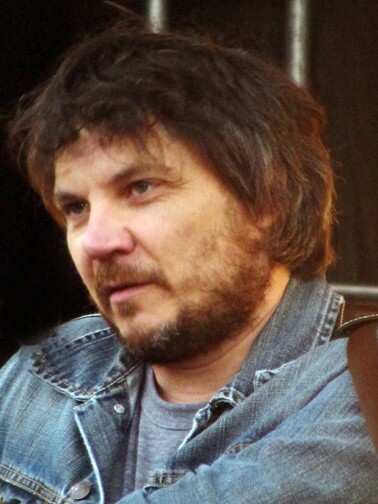 On stage yesterday afternoon Tweedy, who continually engaged and interacted with the audience, repeatedly asked if fans had enjoyed the festival. In response to the overwhelmingly positive feedback from the audience he stated what a great and unique experience it had been for the band. Although there were about 3,000 enjoying the concert there was a remarkable intimacy. I stood on my feet packed in with hundreds of others in front of the stage for almost two hours. The sense of focus and attention all around me was positively riveting. Think about it. How many performers, with just a guitar, can hold a young audience absolutely spellbound for some two hours? Many about me were singing along. They seemed to be mostly avid fans. Tweedy joked and played with them. He seemed both laid back and in total command. This was not your garden variety rock event. 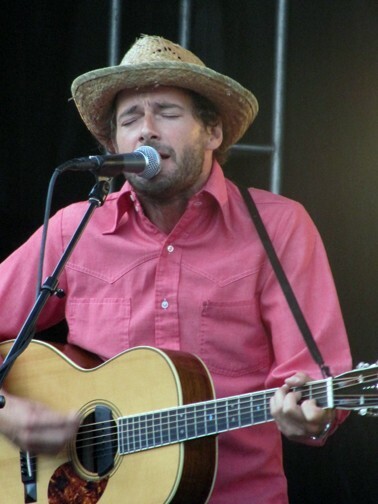 The stocky Tweedy was casual in jeans with a scruffy beard and unkempt hair. Now in his 40s he has a tough, craggy weathered demeanor. 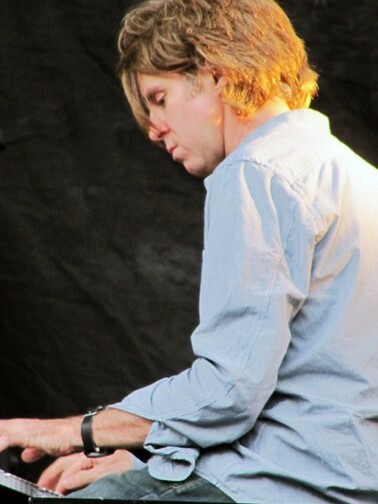 There is a lot of passion and life experience packed into his compelling songs. The lyrics are rich and complex. The delivery was smooth, articulate, and brilliantly accented with superb picking on a range of guitars. Given the almost 100% humidity the guitars quickly went out of tune. Which was observed by the audience. "You aren't going to give me a break" he quipped. He reached for a sweet little Martin for his second song. But there was something wrong with the pickup and it was retired for the evening. 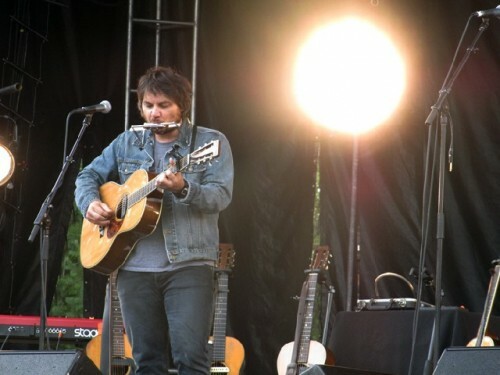 "Luckily I have some other guitars" he said evoking a laugh from the fans. He put a kapo on the next guitar stating "That's what I wanted to avoid (by playing the smaller Martin). Who says rock stars can't be lazy." As the set progressed fans shouted requests. "I could play that but I don't want to." To a shout for "Single Women" he said "I don't play that anymore. It was a one shot deal." Then "Keep shouting requests and you'll say the one I was going to play anyway." To one persistent fan he said "Hey, you're standing in the exact same place you were in last night. You must like my profile from that angle." When a fan put up a sign with "J.T. I Love you" he said "Oh yeah you like James Taylor." He apologized for his voice being a bit hoarse. "I got dunked" he said. He and other band members volunteered for a dunking tank to raise money for charity. "I'm not used to being wet. I don't even take showers." The set included 25 songs: "Sunken Treasure" "Remember the Mountain Bed" "Please be Patient with Me" "Muzzle of Bees" "Via Chicago" "The Ruling Class" "Bob Dylan's 49th Beard" "Simple Twist of Fate" (Dylan) "Shakin's Sugar" "Someday Soon" "New Madrid" "Lost Love" "I'm Always in Love" "Spiders" (Kidsmoke) "Tennesee Porch Swing" (with Sir Richard Bishop) "Ingrid Bergman" (with Nick Zammuto) "Look Out For My Love" (Neil Young with Avi Buffalo) "Dash 7" (with Nels Cline) "The Family Gardener" (with Scott McCaughey) "Someone Else's Song" "So Much Wine" "It's Just That Simple" (with Autumn Defense) "Passenger Side" (Wilco) "Outta Mind/ Outta Sight" (Wilco). Which is a truly remarkable statement considering all of the logistics, staff time, expense and detail that went into this bold experiment. Consider that Mass MoCA is a museum. One of the three top contemporary art venues in America (The others are Dia Beacon, in New York and Chinati and Judd Foundations in Marfa, Texas). So how does an art museum get involved in organizing a rock festival? Imagine if you woke up one day and there was a rock festival in your own home town. Like you could walk to it. Even though, by rock festival standards, this was intimate. Clearly Tweedy would like to keep it that way. Although a couple thousand more ticket sales would help the bottom line. The cap that has been discussed is about 7,000. So, as Jeff says, let’s be hush hush about this and not tell everyone how absolutely wicked awesome it was. Hey, you didn’t hear this from me. Also, my bad, I misreported the activity down town. Apparently, the restaurants and pizza shops did steady business all day. And the town was hopping on Saturday night after the Wilco concert. There were spontaneous street musicians and partying. Seems folks hung out and had a great time. There was, however, a screw up on liquor licenses and extended hours. North Adams goes to sleep early. The plan was to get a variance to stay open until 2 AM. But those extensions did not come through on time. So some restaurants closed between 10 and 11 and missed the crowd. Traffic during the day over the weekend was mixed. Visitors were moving about but just an increment of those on the MoCA campus. Shops did well overall. It was also the No Tax weekend so that helped. The Hudsons who have a shop on the MoCA campus said that they made sales but mostly small stuff. People don’t come to a rock festival to buy antiques. But if we do this next year North Adams can make huge improvements down town. There were spontaneous performances by local musicians. But what would it take to close off Main Street and erect a stage. 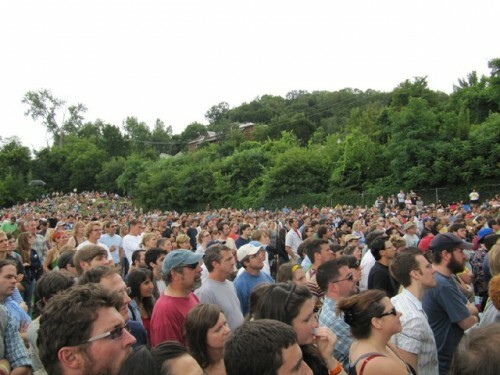 Having a weekend long free festival with music, arts, food, and kid stuff would bring out a large local audience that can’t afford or aren’t interested in the Wilco event. The locals mostly stayed home and hunkered down. This was not their festival. What a pity. On Saturday night there were long lines for the food venues on MoCA’s campus. With a bit of redirection either there might be more vendors on campus or more alternatives on Main Street. That would also increase traffic for DownStreet and other area galleries. Also there was little effort to get the word out on the MoCA campus. There was a table promoting North Adams, next to the entrance, the little fans were clever, but no piles of flyers for the Eclipse Mill and other galleries. I wonder how many visitors made it to the Clark or Williams College Museum of Art over the weekend? We spoke with lots of out of towners. There were some guys from New Jersey camping up in Pownal. Folks from D.C. Ran into a family from Williamstown across the border. Imagine that? Lots of kids from Boston. From the audience a girl told Tweedy that she needed a ride back to Boston. He hooked her up. Then somebody else was looking for a ride. There was a volunteer but Tweedy said “No, you’re not going with him. I don’t trust him.” That got a good laugh. The primary focus is of course the music. At best I sampled the bands and my responses are mixed. 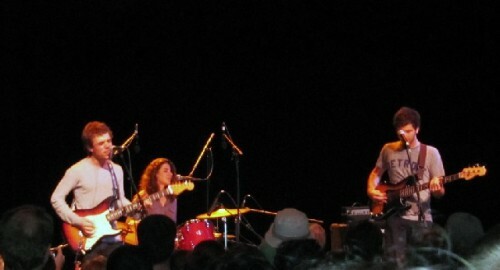 A number of the bands were Wilco spinoffs as well as some very young musicians. The falsetto of the very young lead singer of Avi Buffalo failed to impress. Other than Mavis Staples there were no major acts or headliners. Which is why the numbers hovered below projections. We just about saw the limit of the drawing power of Wilco. The combined weekend attendance was about the same for their concert at Tanglewood two summers ago. Thought will have to go into keeping the festival fresh next year. The programming Friday night, for example, was pretty soft. The biggest draw was The Books which is a North Adams/ Willianstown based act. They were fabulous and performed for a packed and enthusiastic audience in the Hunter Center. But there was nothing planned for Joe’s Field and its large capacity. Perhaps a headliner performing on the largest stage would have doubled attendance. Overall, considering the effort and expense to develop the stage on Joe’s Field, it was under booked. It was idle on Friday. Used from 6:45 to 11 on Saturday and from 4 to 6 on Sunday. Perhaps Wilco was reluctant to share the spotlight with anything other that their own spinoffs, minor, and emerging acts. They hail from Chicago so why not bring along some of those great blues artists. They could have run a sidebar blues festival on Joe’s Stage in all that down time and not been upstaged. 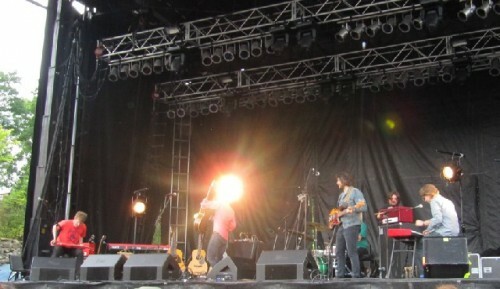 During Tweedy’s acoustic set on Sunday we anticipated special guests. No, Mick, Keith, Bob and Bruce didn’t make it. What we did get was one song each from artists who had appeared over the weekend: Sir Richard Bishop opened the string of walkons. 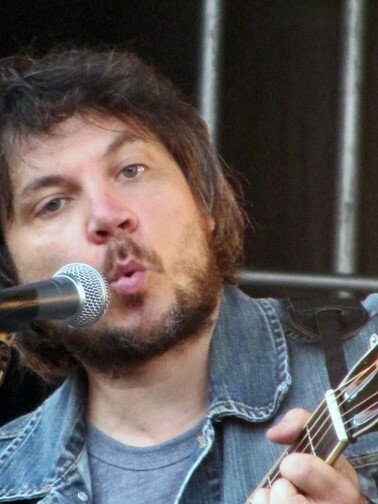 By then Tweedy had been performing for 70 minutes. Then Nick Zannuto of The Books did his duet, followed by Avi Buffalo, Scott McCaughey of Baseball Project, Nels Cline played some slide guitar resting on his lap, and finally a few songs with the entire Wilco band with a drummer subbing for Glenn Kotche. When the guests started to come onstage it was beginning to rain. Just a drizzle. Tweedy asked if he should keep going. The audience roared a yes. But other than a sprinkle the weather was mostly perfect. That helped. The sequence with guests was groovy but not exactly awesome. 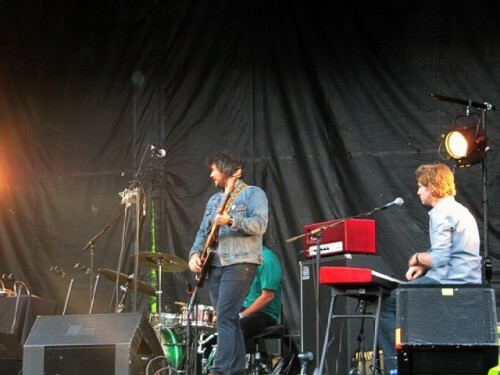 Until the full Wilco band came on and took the energy level back to the peak on Saturday night. 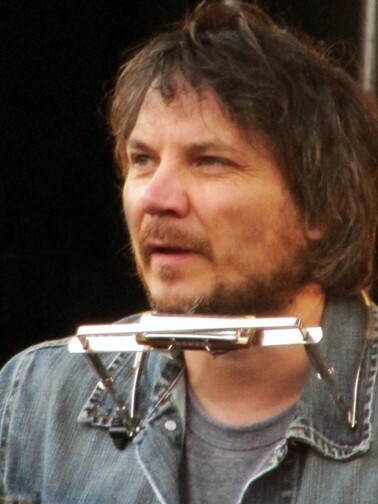 Some critics have gone on record stating that Saturday’s Wilco concert belongs on the short list of all time performances. Surely it was up there. See you next year. "Some clarifications on the promotion and business aspects of the weekend. Develop North Adams, and DownStreet Art manned tables at the festival for most of the weekend. On Friday night, we handed out over 1,000 flyers to direct people to Downtown North Adams on Saturday, for both a morning arts and farmers market and a late night event after the show. Also handed out were nearly 1,000 DownStreet Art brochure/maps as well as a special "Where to eat and drink map". The Saturday morning went very well, and was well attended, and did what it was supposed to do: Draw people downtown. My wife's store, Shima, made more money before noon on Saturday than on any day ever. They made more nearly 2 weeks revenue over the weekend. Petrino's and the Hub have never served more meals in a day as they did on Saturday. Saturday at the morning event as well as at the show, we handed out the better part of 2,500 of the aforementioned 'fans' that advertised the evening event (as well as the Fall Foliage Parade). DSA again handed out thousands of maps. 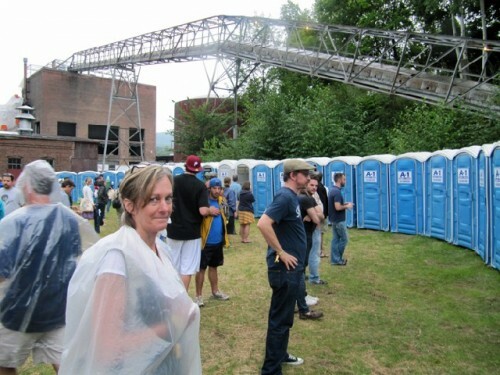 As people were exiting after the concert on Saturday, MASS MoCA staff was also telling people of the downtown event. The music and lighting throughout downtown on Saturday, was planned by, and paid for Develop North Adams to make for an enjoyable experience for all (which I think we succeeded at). Not only did we want to draw as many people as possible downtown to help businesses, we also simply wanted to show people a good time... so that they return to the city (or, even better, move here). Overall a great success. If anyone has ideas of what we can do next year to make it even better... please post on the Ideas forum at www.developnorthadams.com. " "It is ridiculous to suggest that downtown North Adams should erect a stage and host performances for a local audience during the next iteration (if it happens) of the sound festival. 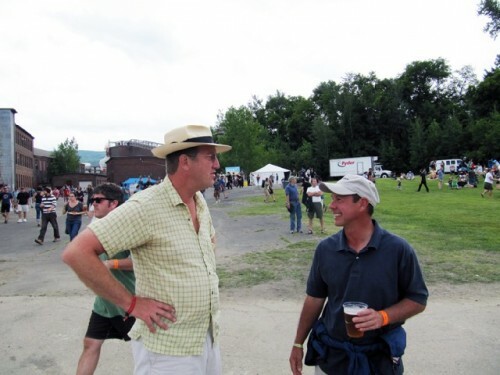 The sound festival was as much a local event as a national one and it would be wise for North Adams to support the hard work and creativity generated by MassMoCA, not compete with it. You are perpetuating a discourse of opposition through conjecture and hyperbole by stating that locals mostly stayed home and â€œhunkered down.â€"